This workshop will dive into drawing extraction as a means to utilize your 3d models in the generation of 2d drawings. We'll be moving from 3d to 2d and back again, all the while laying out various plans, sections, elevations and axons. We conclude with a discussion on creating exploded axonometric drawings from 3D models in Rhino. By now you should be familiar with the different types of Architectural Drawings that can be used to formally describe an object or spatial condition. Last week's session looked at orthographic projections as one technique of graphical projection. This week we will look at some examples of axonometric projections and how this technique can be used to describe selective aspects of a design. 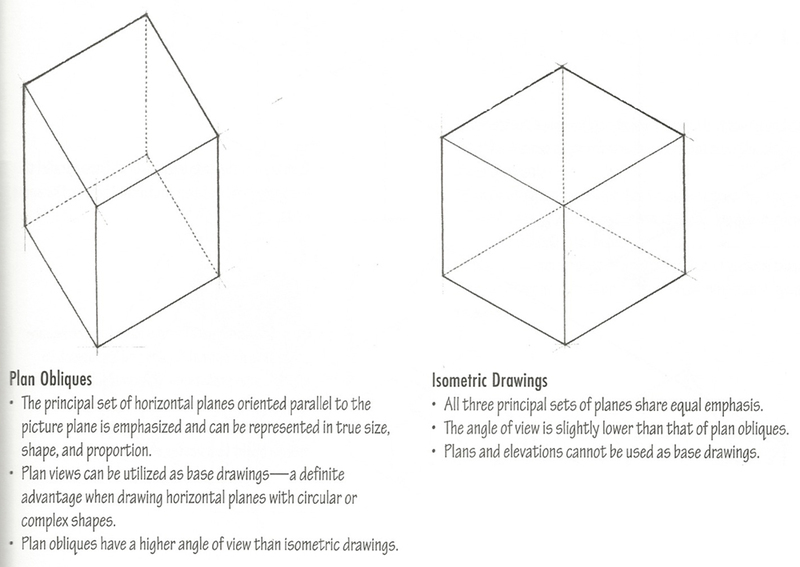 We will begin by looking at an overview of Axonometric Drawings with a specific focus on isometric projections . 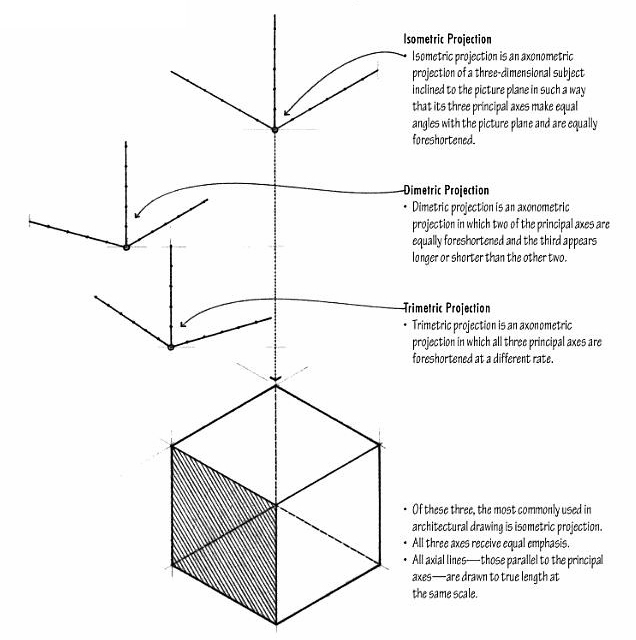 In Axonometric Projections an object is rotated along one or more of its axes relative to the plane of projection. Projection rays are parallel to one another, and perpendicular to the image plane - but in no specific relationship to any dominant plane of the object depicted. Uses equal angles of 120º and is the most commonly used form of axonometric projection because of its ease of use with a 30º-60º triangle and clear representation. There is equal foreshortening on all sides (80% of the true size) and thus the plans and elevations cannot be used as base drawings. Has equal foreshortening along two axis directions often emphasizing the elevation. This technique is less common as all three axes planes are foreshortened and all axis angles are different. Plan obliques are another method of paraline drawings that communicate the three-dimensional nature of an object or spatial relationship projected from the plan itself. The principal set of horizontal planes oriented parallel to the picture plane are emphasized and in these types of drawings the plan can be used as a base drawing (i.e. the plan reveals the true size, shape and proportions). The following method outlines the steps required for Placing an Isometric Camera View in Rhino using the Camera. 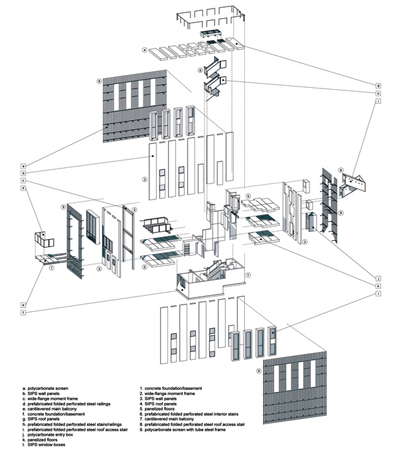 An exploded axonometric takes the original construction of an object and displaces selected elements to illustrate construction assembly or, in the context of architecture, spatial relationships. Exploded axonometrics can be extremely detailed, such as a construction detail, or as we touched upon in Week 03, they can be more diagrammatic, such as in a program or circulation diagram. Exploded axonometric drawings should be carefully considered for what they are trying to convey. There should be a considered logic in how an object is exploded and what the selective exploding means as part of the overall drawing. We will only be referencing the first half of this workflow that deals with setting up the Exploded Axonometric view and exporting our linework. This workflow emphasizes the proper orientation for an exploded drawing and using post-processing effects in Photoshop and Illustrator to illustrate shadows and textures. While you are not expected to apply materials or textures in this project, you should by now have all of the tools at your disposal to know how to do this. We will also look at the basics of VRay rendering as an alternative to Rhino render. An axonometric drawing uses parallel project to maintain some measurability, while providing a 3-dimensional view of whatever we are modelling. An exploded axon takes this original construction and displaces selected elements to illustrate construction assembly or, in the context of architecture, spatial relationships. Exploded axonometrics can be extremely detailed, such as a construction detail, or they can be more diagrammatic, such as in a program or circulation diagram. Exploded axon of case-study building assembly. This workflow shows how to use the Shear command to create an isometric view in Rhino of an existing digital model. The linework will then be exported to Illustrator where a few pointers on stylistic effects can help create descriptive and eloquent presentation diagrams. This workflow details methods for the creation of a section and plan drawing from a 3 dimensional model in Rhino and the process for cleaning up the output, deciding what information to keep / delete and what needs to be drawn to complete the understanding of the space. This workflow emphasizes how to use extracted line work from a 3D model in order to iterate and refine a design. Precision, accuracy and organization are also emphasized in using the line work to produce a final drawing set. Starting with an existing digital model, we will redesign and refine portions of a building. The use of layer management is critical in working efficiently. Retrieved from " http://studiomaven.org/index.php?title=Course:200c_f13_steinfeld_session_727843 "